Fallout’s bold new step into a multiplayer-centric title with Fallout 76 is already proving quite the undertaking. Without the usual trappings of an entry in the series, such as NPCs, Fallout 76 must find new ways of holding interest. Will the always-online model and the franchise’s largest map cut it? We can’t know for sure until long after launch. But Bethesda has plans to bolster the experience with an extensive amount of side content: 150 hours worth. Developers from Bethesda Game Studios, relayed this information in an interview with Official Xbox Magazine. Over 150 hours of side content will be available for players at launch. Additionally, Bethesda has “aggressive” post-launch plans in place to ensure players are sated long past the release date. 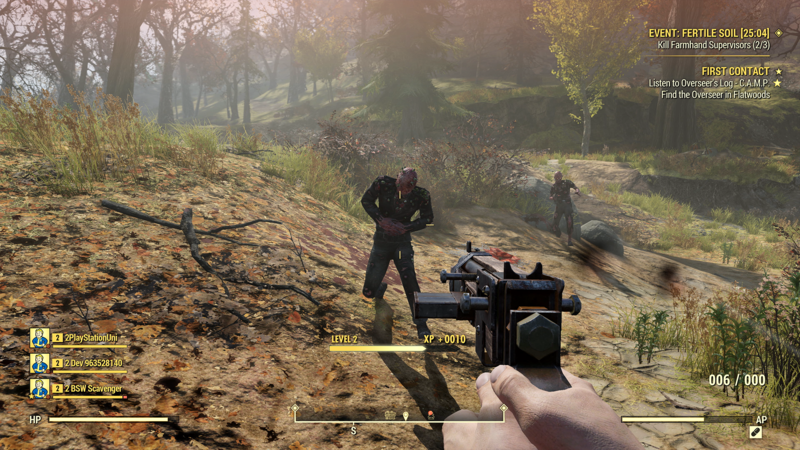 Fallout 76’s Project Lead, Jeff Cardiner, offered details on how players will manage survival skills, specifically where ammunition is concerned. Remember it is a survival game. So we found early in play-testing that people were like, his character’s going to go away in three hours, so I’m going to use all my Stimpaks and ammo,’ but when you’re playing ‘for real’, you’ll make very different decisions. Do I really want to kill this guy with my one Fatman shell, or do I want to save it for the Scorch Beast, because it took me hours to get it. You do make different decisions when your characters are ‘real’. You play this game 30 hours, 300 hours; sometimes you’ll play in a group, sometimes you’ll focus on certain activities but sometimes you’ll play solo. And those are the times when you’ll have time to delve into the fiction and listen to the holotapes and read all the monitors and really get into the story. But there is more of a tension there, you can’t pause the game to read a terminal. When you’re reading a terminal something could sneak up behind you and eat you. And it often does. The more we’ve play-tested, the more we’ve realised how viable that is, and it supports the idea of how dangerous and how lonely it is out there. Fallout 76 launches in a few short weeks on November 14, 2018. An Xbox One beta, for those who have preordered the game, is currently live. PlayStation 4 and PC users can dive into the beta on October 30, 2018.